A beautiful and simple story about an elephant told in nonsense verse. ..
आम के पेड़ पर है घोंसला और उसमें रहते हैं चिडिया और उसके बच्‍चे। अभी तो नन्‍हे..
मजेदार कविता जिसमे गर्मी और बारिश के मौसम है और बारिश मे भीगने की मस्ती भी। ..
Haiku, written about hundred years ago, are special poems that consist of only three to ten words. H..
अकाल और उसके बाद की परिस्थितियों को दर्शाती चित्रकथा ! .. Wonderful collection of children’s songs created by children themselves during play. 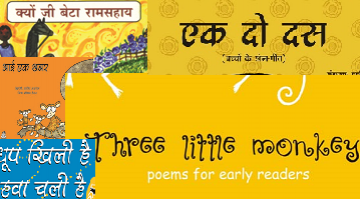 Rhyming words a..
A collection of popular short poems and songs passed on from one generation to another like Chanda M..
इन कविताओं में किस्से-कहानियाँ हैं, अनेक तरह के रंग हैं... वह सब कुछ है जो प्राथमिक स्तर के बच्चों क..